RUSH: I’ve been holding on to something here for a couple of days. What it is is a massive Twitter thread by an anonymous individual who goes by the name of “NameRedacted,” and it is 33 tweets that constitute a single thread. SIRI: What do you want to know? RUSH: I didn’t say, “Hey, Siri!” What the hell are you talking about? My phone just started. Siri just said, “What do you want to know?” I didn’t ask Siri anything. I’ll put that aside. 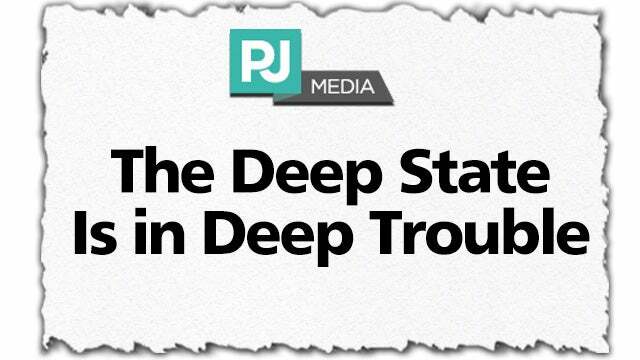 And when I looked at this, since it’s anonymous, it is a huge takedown of the deep state. 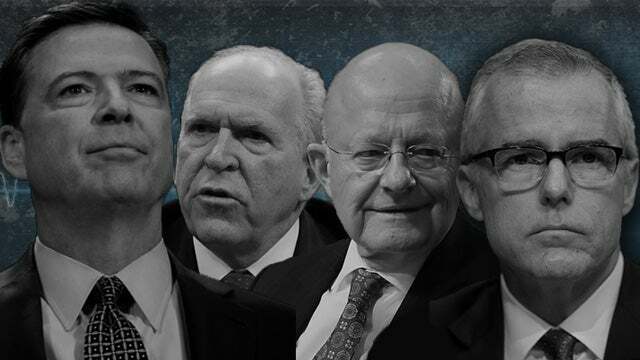 It’s a huge takedown of the DOJ, Andrew McCabe, James Comey, John Brennan, Clapper, the entire intelligence and law enforcement establishment. It is a giant takedown. The premise behind it is that these people are in panic mode because they are in great fear that everything they have been engaged in is about to be exposed publicly in a way they’re not gonna be able to control. But since it’s anonymous, and since I don’t spend any time on Twitter (I had this sent to me), I have been holding it aside. I read it, I’ve kept up with it, but I can’t verify it. I don’t know who NameRedacted is. So today, there is a story at PJ Media by Roger Simon, who is eminently respected. He has a tremendous journalistic reputation. A fine man, great character. And he has a piece that’s based on these 33 tweets that constitute this thread, and his piece is “The Deep State Is in Deep Trouble.” He begins, “Why would some ‘concerned citizen’…?” That is not this NameRedacted person. “Why would some ‘concerned citizen’ suddenly leak information to ABC that Jeff Sessions was under investigation for perjuring himself (about Russia, of course) during his confirmation hearing…?” That’s the starting point for this, and remember earlier this week it was leaked that Sessions was under investigation for having lied during his confirmation hearings about colluding with Russians — during the transition and slightly before — when he was a U.S. Senator. The leak was to ABC, and we learned that the investigation was started by “none other than Andrew McCabe,” who has since been fired from FBI. 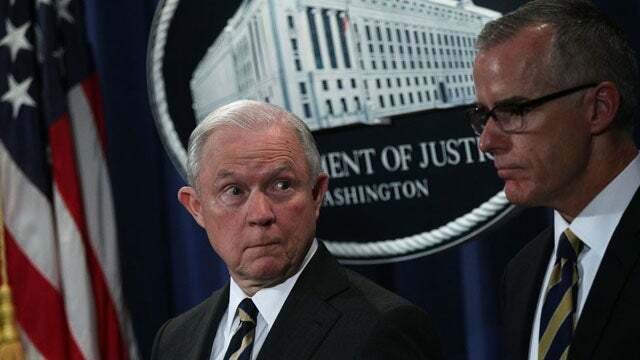 Andrew McCabe began the investigation of Jeff Sessions — and whether or not he lied during confirmation hearings about his relationship and knowledge of the Russians — because McCabe got a letter from Senator Patrick “Leaky” Leahy and Al Franken demanding an investigation. So McCabe did it! Well, what was unknown to everybody was that Mueller had already cleared Sessions! This is months and months and months ago. Sessions was long-ago cleared of having lied. The fact that they even commissioned an investigation is odd. Sessions didn’t talk to any Russians. He wasn’t colluding with anybody. This was how they engineered his recusal! So there’s an investigation, which is outrageous! Well, the reason for the leak of that information was to be able — for the deep state (ABC News also) to be able — to claim that McCabe got fired by Sessions because Sessions was getting even with McCabe for investigating him. But that is not supportable. Sessions was cleared months ago. Sessions had nothing to do with creating the report and the evidence that McCabe had lied. Sessions was simply the guy who executed the recommendation to fire McCabe, but he had nothing to do with the investigation or anything else in the McCabe case. This was done specifically to give McCabe cover so that McCabe and others could run around like a bunch of spoiled kids claiming that he was only fired because Jeff Sessions was getting even with him. It is a major distortion. But since that aspect of this is being talked about, I thought I’d go through quite a bit of this, these 33 tweets, because whoever this NameRedacted person is obviously sounds like somebody connected. Now, Roger Simon at PJ Media is writing about the fact “that Sessions was long-ago exonerated of this charge by none other than Robert Mueller. Furthermore, just hours after ABC trumpeted its ‘exclusive,’ current FBI director Christopher Wray reaffirmed that the firing of McCabe was justified” and that Sessions had nothing to do with it! And then Simon asks: Why is this cabal trying to end Trump’s presidency all of a sudden “so panicky? Well, as we know, the inspector general’s report is coming out soon, although some now say it may be delayed to as late as May. But” if it’s delayed until May “that would only be because it is growing more extensive” as they are continuing to learn of more malfeasance and corruption. “And a secret prosecutor, it is known, is now working with the” inspector general. So it’s not just [Michael E.] Horowitz, the inspector general of the FBI, DOJ himself. He’s got a prosecutor working with him on all that he is uncovering about this cabal. And this is why we’re beginning to see the first cracks, if you will, in the cabal. “The extent of what was occurring back when Sessions was ‘under investigation’ is hinted at by an anonymous Internet character with the amusing moniker” NameRedacted, and here are the tweets in the 33-tweet thread referring to this.